There will be a final exam in this class, as stated in the syllabus. Puzzled, I stared blankly back at the screen. Maybe I didn’t read the syllabus closely enough, but for the life of me I couldn’t completely remember a final exam. The last time I took an exam for anything I was in college and the last time I was in college was, well, a million years ago. I started to wonder what this “final exam” would be like. I’ve taught a few online courses throughout my teaching career, but Coursera claims to be in a league all of its own. What would their final exam look like, how would it be administered, and most importantly, how would the instructor grade thousands of student entries? Even in traditional classrooms, more and more students are submitting their work through email or educational portals hosted by the school. I don’t accept hard copies anymore just like I certainly don’t accept hand written assignments. I give my students a due date and they know the rest. The tricky part is getting meaningful feedback back to them in an efficient manner. It would be silly to print everything out and mark their papers with a red pen, but its always a hassle to save their work to my hard drive and fuss with track changes or editing software. Multiple choice is one thing, but what about written responses? Its gotten to the point where I simply type out a paragraph at the end of the paper expressing my notes, praises, and/or corrections and then put a grade. But is that enough? 1. Dragon Naturally Speaking takes voice and moves it into text making it easy for instructors to speak their corrections rather than type them all out. When you have over thirty, 30 page papers to grade, you don’t want to spend all week at your computer. I don’t know about you, but I’m definitely loosing my eye sight. 2. I’m also someone who would rather write out my corrections by hand, as opposed to type them on screen. I find this quicker and more authentic. “Inking” or “Digital Inking” is a way to literally write out what you want to say on a tablet and then that written message can be sent to anyone. Your handwriting stays intact. Digital inking is also great for drawing pictures or diagrams. You can use the technology in programs like Photoshop. Jing is another product that allows users to take screenshots, capturing an image of what they see on their computer screen, and also record screencasts. Screencasts are recorded video of up to 5 minutes of onscreen footage. On the website, Jing claims that this service is great for education: “Give your students the information they need, when they need it. Use Jing to record your feedback as you grade papers, or take a snapshot to share with your class. Your students can even use it to collaborate, or ask questions!” Sounds good to me. 4. Google Docs is nothing new, but for those who have been using Google applications and products for a while, you may have noticed its become much more user friendly over the years. 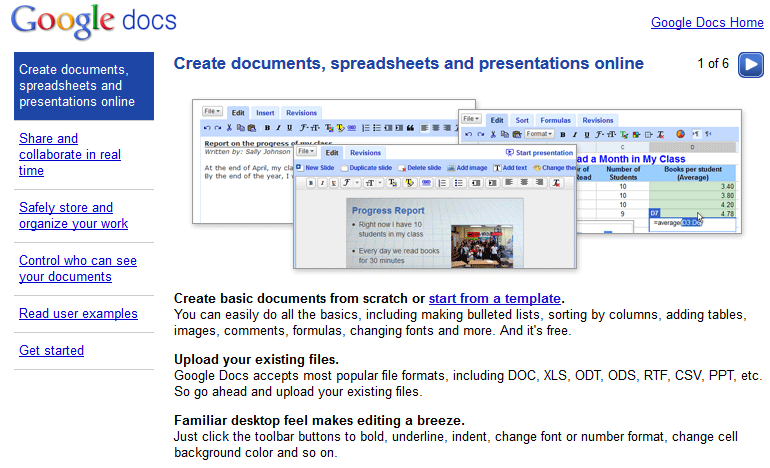 Google Docs is a free software product through your Google email that allows you to store 2 GB of documents online. Google Drive is a great and easy way to share documents with other people. They can edit, view, or both. This service is great for teachers because each student can send in their document, you the teacher can make edits online and then share it with that student. No need to print, no need to save documents to a hard drive. You can ever make folders to keep every class organized. I hope you read this entry closely because I’ve emailed you the final exam. I expect it back to me by Friday. Good Luck!